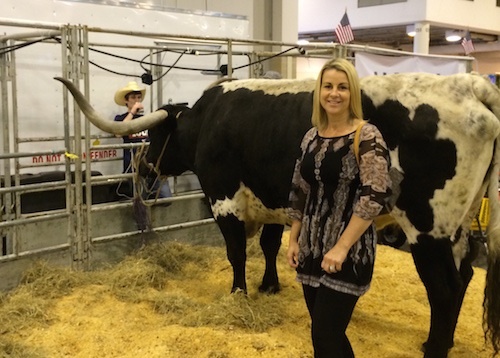 My wife, Kim and I bought our first Longhorn at a charity auction in 2013. We bid on a bull calf from John Baker's breeding at the Sunrise Ranch (home to Bevo - University of Texas mascot). At the time we knew we wanted to get into raising Longhorn's, but honestly, we were not ready yet with respect to infrastructure at the ranch. When our young bull (BF Sunrise Sir Oreo) was weaned and the owners were ready to deliver him, she said we can't just have one! We ended up buying his buddy, our steer (BF Sunrise Dr. Red Duke) and a 6 year old cow (Scheible's Sally) that had been breed back to Sunrise breeding. 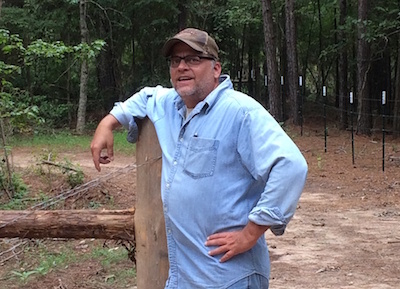 My family is in the timber growing business, our ranch located in the Piney Woods of East Texas is comprised of 135+ acres and consist mostly of Pine plantation and forest, not pastures for longhorns. We very quickly began building two small pastures one 3 acres and one 5 acres to hold our new Longhorns while we completed fencing the entire perimeter of our property with brand new fencing, In fact we just completed that this past spring 2015. Once our first three cattle showed up at the ranch, we were hooked! We started researching blood lines and viewing a few breeders' websites in addition to calling on Dora Thompson at the Sandhill Ranch in Mansfield, LA. She gave us a tour of her 200+ head of Longhorns. In the summer of 2014 we were fortunate enough after searching eLonghorns and joining the TLBAA and the Texas Longhorn Marketing Alliance to find a beautiful young cow that happened to be from Marquis Arrow breeding and sired by Ms. Thompson's Bull, MMW Gorilla. Without hesitation we acquired M Arrow Dorthy and her heifer calf out of Top Gun, a son of Top Caliber. As an added bonus she had been exposed to Run Em Juma, son of Juma and grandson of WS Jamakizm. A few months later we found a cow calf pair and the calf was sired by the great bull Top Caliber. After a 5 day bidding frenzy on eLonghorns, They were ours! Our goal is not to be the largest breeder, but to selectively breed some great pedigrees and eventually become more involved with the various breeding organizations, attend shows and continue to work with youth by assisting them either financially or providing Longhorns via loan for them to show. In fact our Top Caliber heifer will be heading to NASA in July to become part of the NASA Longhorn Project, which is a partnership between The Gulf Coast Breeders Association of the TLBAA, Clear Creek Independent School District and The Houston Livestock Show and Rodeo. We are very excited to help the youth in our community with some of the first cattle out of our program.